Zion National Park - Canyon Overlook Trail / June 10, 2014 by Brian D.
I was staying in St George Utah for a week long golf vacation, I know tough life...We played some of the best courses to include; Sand Hallow, Sky Mountain, The Ledges, Green Springs, and The Woodbridge golf courses. Zion National Park is roughly an hour from St George. While we didn't stay near the park this trip, Springdale Utah is the obvious place to stay just minutes from the entrance to Zion National Park. 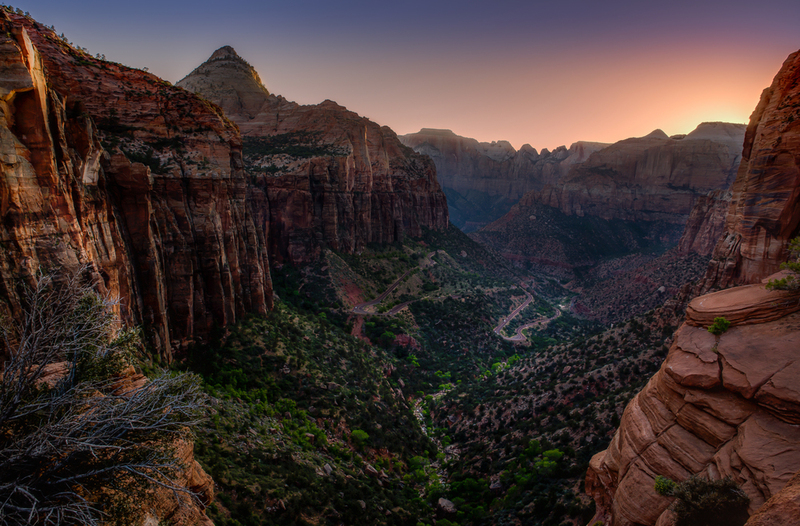 The Canyon Overlook trail is one of the best kept secrets of Zion for photographers of all levels of fitness. The trail is roughly a mile round trip and takes only about 20 minutes to hike. The views throughout the short hike are absolutely amazing but the end view of the entire park from roughly 600 ft is exceptional. To access the Canyon Overlook Trail you follow Route 9 (Zion Park Blvd) through the tunnel and once you come out the parking area is immediately on the right. Parking is limited to about 10 cars. If you are not lucky enough to score a parking spot there is additional parking about a 1/4 mile down the road.